The Building Design & Construction Systems division is one I consider to be a “cumulative” exam because it touches on a lot of topics from the other 6 AREs. In addition to a very broad range of questions in the multiple choice portion, there are THREE vignettes, the most of all the 7 exams. 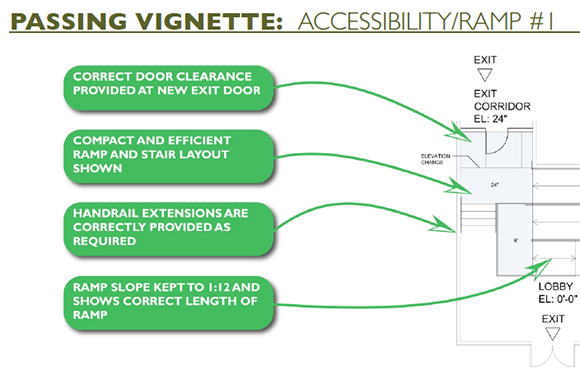 First, we’ll take a look at the Accessible Ramp Layout vignette. For this vignette, you will need to connect two levels in a building with a fully accessible ramp. 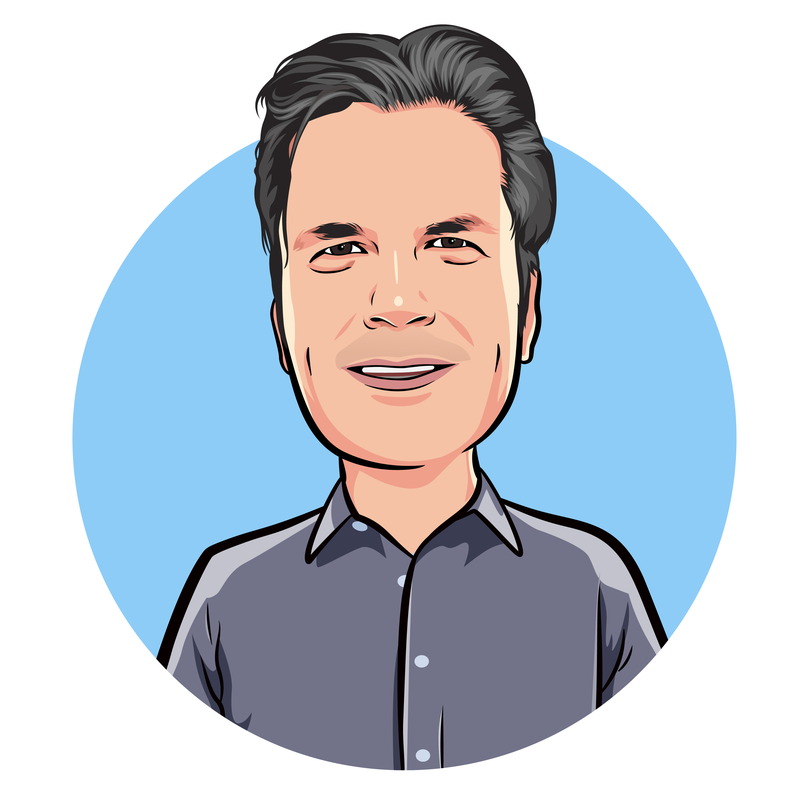 This vignette is fairly straight forward, however here are a few tips on how to approach your solution and stay organized. Be sure to practice with both the NCARB software and the program so that you are prepared to tackle this one on exam day. 1. Follow the program. Is there an echo in the room? If you’ve been reading this blog for a while, you’ll notice that I start every vignette tip post this way. Simply stated, it is because this tip is the MOST important. Don’t veer off from what the program wants, stick to it and half the battle is won. 2. Connect the levels. 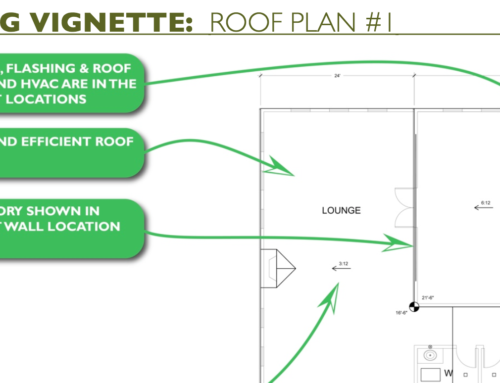 For this vignette, you will see two levels in plan with the elevation of each marked on the floor plan. You will need to provide a ramp that connects the upper level to the lower level correctly. Remember in order to do this, you must maintain the required slope from the program. This means if you have an elevation change of 30″ and the program requires a maximum slope of 1″/12″, your ramp must be 30′ long. 3. Label the landings. Once you have drawn your ramp layout, don’t forget to set the elevation height at each landing to verify you are maintaining the slope required by the program. The top landing should be set at the same elevation as the upper level and the bottom of the ramp should be at the same elevation as the lower level..
4. Guard the ramp and stair. Both the ramp and stair will require handrails/guardrails to properly protect the edges of each element. Be sure to place the rails along all sides of the open stair or ramp, along the length of the stair or ramp, and don’t forget about any extensions required by the program. 5. Efficiency counts. Your ramp and stair layout should be simple, clean and efficient. Don’t go overboard on the number of landings or switchbacks in order to connect the two levels. Your solution should aim to take up as little floor space as possible. 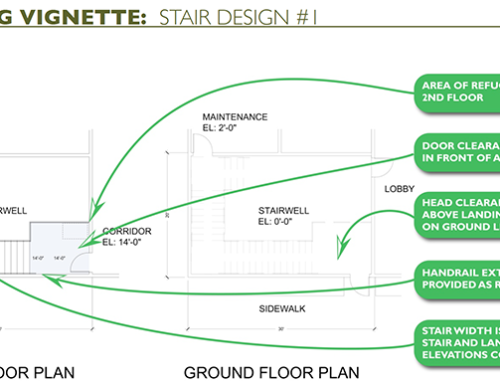 As the first vignette for this exam, it is fairly straight forward and will get you thinking about how to properly connect multiple levels, which will be helpful moving on to the Stair Layout vignette. There are several correct solutions for this vignette so keep in mind as long as yours meets the program requirements you should do well. Since there are three vignettes for this exam and you are given one block of time to complete them all, it may be a good idea to time yourself once you have practiced with the software and program and feel comfortable with how to solve it. Being as accurate as possible while also being as quick as possible will help you save time for the remaining two vignettes.